Michael Neustel enjoyed participating in an IP Roundtable with USPTO Director Andrei Iancu, U.S. 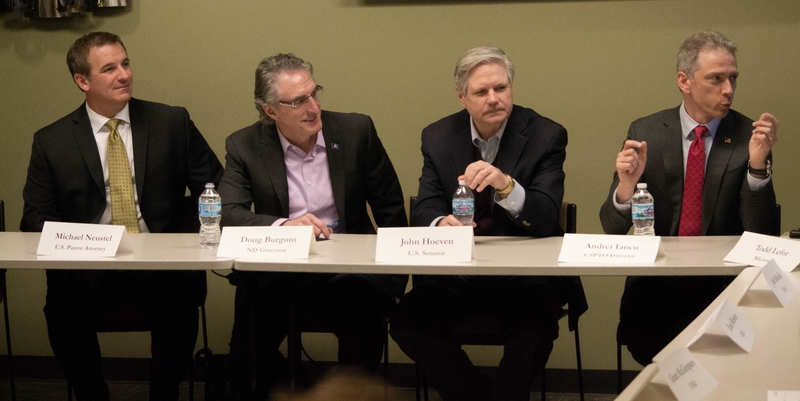 Senator Hoeven and ND Governor Burgum on November 30, 2018 which was attended by various business and university leaders. Director Iancu did an excellent job of discussing the various intellectual property issues at the USPTO and how the USPTO is moving forward to improve the services it provides to the intellectual property community. Director Iancu even provided additional time after the IP Round Table to meet with Michael and a local business leader to discuss various issues important to small businesses. We appreciate Director Iancu coming to North Dakota not only to visit our great state but also to share his vision of the future at the USPTO! U.S. Patent Attorney Michael Neustel with USPTO Director Andrei Iancu, U.S. Senator Hoeven and ND Governor Doug Burgum.